Your website can be one of your most profitable investments. How? Simply by providing a quick view of your products or services, and promoting your value or philosophies. A good website can make potential clients or users want to engage with you and learn more about what you have to offer. We can help you make your website as simple or as sophisticated as your business requires. We believe in getting you up and running now, while exploring where you want to go in the future. We will help you evaluate how often you need to update your content and help you identify how to further exploit your presence on the web. We will show you how to keep your content fresh and compelling -- to support your new and ongoing business clients and relationships. If you have a tired website, contact us. We can help revive it and show you how to keep it updated with minimal effort. 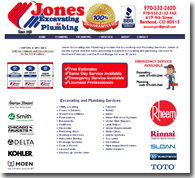 We can also show you how to leverage your web information in your brochures, newsletters and other printed materials. You've invested in your information, why not fully utilize it? Our sample sites show some of the sites we have developed or revived. We have affordable rates. Your presence on the web could be your most important and profitable investment. New or "used" we can help -- Contact Us!